Reviews | Pink Sprinkles - 10 lb. Put the finishing touch on all of your desserts with a burst of pink color from these fun, decorative sprinkles! They'll add sugary sweetness and unique texture to any dish. The uses of sprinkles are endless, making them a versatile ingredient to have on hand. Sprinkle these tiny, thin, rod-shaped confections into your signature cookie batter, atop a flavorful ice cream sundae, or use them to garnish frosted cupcakes. Whichever way they're served, they're sure to be a staple for your ice cream parlor, bakery, or diner. And with 10 lb. of sprinkles, you'll be in good supply! I have a thing for sprinkles! These sprinkles are great! Color consistency and quality is on point. I don't really think these are a true pink though, more of a magenta. They're great but it you're looking for a true pink, these might not fit the bill. Recently purchased the 10 pounds of pink sprinkles last month to top on our desserts. They are a great choice for your festive desserts. Used them for Valentine's Day desserts. It's a really cute pink color that is also great for baby showers or gender reveal themed cakes. Great price for sprinkles! Better than anywhere else I have found. It is really nice to be able to purchase colors individually in bulk. We used them for our Valentine D?pe Bites and they look great!! Very vibrant! This is a nice color of pink as it is bright and not just a light pastel color. I like them for baby girl or girl birthday party orders. These are a deep pink! So bright and adorable. I love to use these on cupcakes and other baked goods to add a pop of color. Such an incredible deal on sprinkles. Especially when you solely need a particular color in a large amount. These have a great flavor and cake well packaged. The pink sprinkles are fun and scream baby girl. We use them to decorate all our baby shower baked goods, and the color is perfect. These pink sprinkles are really pretty! They were packaged well with no broken pieces. The color is bold and shiny. Works well on small cookies, which is works great for me! The pink sprinkles are precious and the perfect topping when we do baby shower pastries and donuts. A great quality sprinkle and love the price. 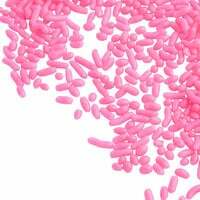 We love these pink sprinkles - we usually use them mostly around Valentine's Day in combination with red sprinkles in our ice cream. They are also great for topping cupcakes. These are a must have topping on your ice cream topping bar. Everyone loves sprinkles and they are one of the cheapest toppings you can buy. These are amazing. A fun pink colored sprinkle that really stands out among the other toppings. Great for all the ladies and little girls. The sprinkles taste excellent. These pink sprinkles are perfect for decorating Valentine's Day cupcakes. They are priced low, which is always a plus. They can also be added with other colors for a more colorful look. With the popularity of gender reveals, we began to buy pink sprinkles in bulk. We make a confetti cake and these work great in them. A great and bold pink colored sprinkle. A great product. Excellent sprinkle. These are the soft sprinkles. The color is nice and bright although I did find the color faded if left out in the sun. Great price. I use a lot of sprinkles and love being able to buy them it so many different colors. I love the pink sprinkles for breast cancer awareness month. They are perfect for decorating my cookies and cupcakes. Great to have a wholesale venue to purchase these sprinkles along with all of our other needs from Webstaurant. When adding them to another order they're a great value! A very high quality brand of sprinkles that makes a great topping for ice cream or cupcakes. The sprinkles are packaged nicely and taste great. The pink is great or coating our heart shaped cookies at Valentine's Day. Received these today and they are the perfect color and so nice and bright! This is a great addition to make my cupcakes and cookies have that extra color! These are so vibrant and colorful! We like to add other colors together and make our own color pallette. They taste great also and do not bleed with the froyo. Perfect for special occasions such as valentines day where pink and read are a huge color. Either way, these are sprinkles and taste how they should. These are amazing. I am a huge pink color fan and the shade of these did not disappoint! I've ordered sprinkles online in the past and some have come in half melted but these arrived with a cold pack and in great condition! What a pretty touch of pink to add to any treat. These are great for girls' parties or for heart decorated items and so much more. These sprinkles are perfect for using on our confections that require the color pink. We use them for "its a girl', bay showers, princess themed birthdays and other special occasions for girls. We also blend them with other colored sprinkles purchased from webresturantstore.com for holidays like pink, red and white for Valentine's Day, pink, white and purple for Easter and pink and white for Breast Cancer Awareness Week. We love all of the sprinkle options offered and stock them all! These are the most beautiful bright pink! I would say hot pink is a better word to describe them. They taste delicious. I would love a lighter pink option as well! What a great price for sprinkles! It is so nice to be able to purchase colors individually in bulk. They look great on cakes and cookies post-baking. We did notice that they didn't hold up as well as others we have used when they were put on the cookies before the cookies were baked. These pink sprinkles do not have a consistent color throughout each individual sprinkle. There are some sprinkles that are half pink and half white. Not too much of a deal for my particular application yet something to keep in mind. these are the best sprinkles for the price. Its nice that they have a variety of colors that are sold separately so that you can mix up your own combos. A beautiful pink color on these sprinkles, perfect for baby showers and bachelorette occasions! The sprinkles taste good to boot and can even be baked into batters for an extra touch of pink. These are a great bright pink color! Not a pale color at all. Provides a great punch of color and taste great! I would buy these again! Great color pink- and they really brighten up the cupcakes when we do our pink lady cupcake! We use these inside our Chicken Cupcake as a surprise filling with a raspberry mousse! These are great for decorating for breast cancer awareness month. Pink is very popular this time of year and this is great for fundraisers and bake sales. These pink sprinkles are GREAT! I bought them to decorate a birthday cake. The color was vibrant & the taste pretty good too. Made for a quick & colorful decoration. I love fun sprinkles. These are a great colour for topping cakes or cupcakes and they are also great to add into a light cake batter for a fun pink confetti look (such a fun treat after taking your first bite. These pink sprinkles are really cute. We use them at the bakery for anything that has to do with a baby or a girl. They add a really great pop of color to cupcakes, cakes, and cookies. Most little girls love pink color and using pink sprinkles onto cakes, cupcakes and cake pop, it adds a touch of elegance onto the dessert.